Grape gardeners often become confused as to what should be pruned off and when. Proper pruning will help maintain a grapevine’s potential of producing a good quality fruit crop, develop good vine structure, increase sunlight exposure into the canopy, promote the development of next year’s fruiting wood, and potentially reduce disease and insect pressure. The key to good pruning is learning how to select good quality fruiting wood to leave for cropping. As green shoots mature in the late summer and fall, they will begin to harden-off by developing a periderm (bark layer) that is reddish-brown in color. Healthy shoots will harden-off the full length of the shoot. Any green growth (generally at the tip) remaining at frost will be killed. Proper pruning can help to reduce the amount of unproductive wood and balance the level of fruit crop with the overall vegetative growth each year. Once pruning is completed, the remaining fruiting wood should be spread out over the entire allotted space for the vine on the trellis. How do I prune my grapevines after the first year of growth? Figure 1. 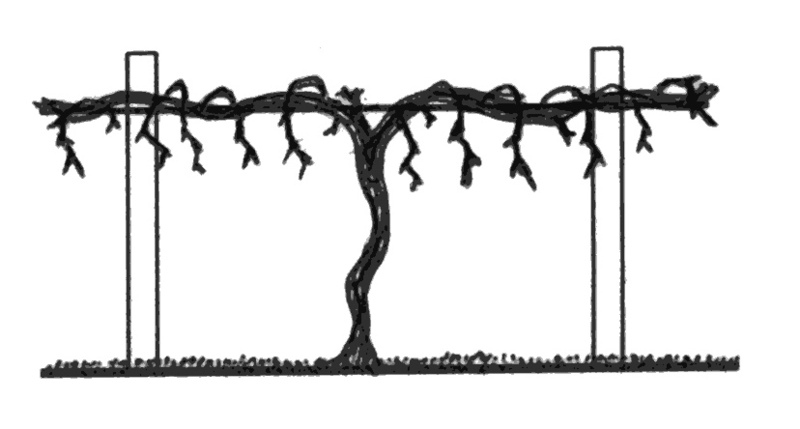 Grapes should be trained to an appropriate position on the trellis or arbor. In the first growing season, remove all fruit and unwanted lateral shoots from the young vines throughout the growing season. Grapevines tend to grow rapidly from the apical end (main growing point) when lateral shoots and fruit are removed. Vines should be staked and tied (using twine or string) to allow the new shoot to form a straight trunk (Figure 1). The leaves should remain on the developing trunk to produce necessary carbohydrates to feed the plant; all lateral shoots, however, should be removed. Only lateral shoots at the top wire will be left. New growth may reach the top wire (around 5 to 5½ feet) during the first year. If this occurs, pinch off the end of the shoot(s) at the top wire and then the lateral shoots will grow horizontally in both directions along the top wire. These will be used to form the new cordons. Pruning of one-year-old hardwood (dormant canes) will be minimal, but some pruning may be necessary to help shape the vine before second-year growth begins. How do I prune my grapevines after the second year of growth? Remove all fruit and any lateral shoots that emerge along the trunk of the grapevine. 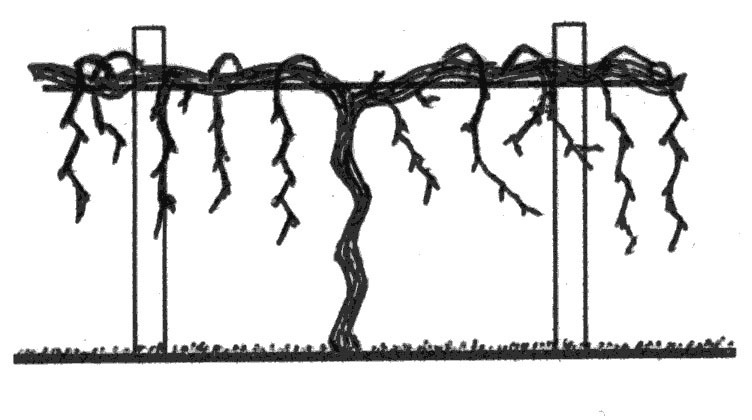 If vines did not complete their structural development in the first year, be sure to train new shoot growth so that the grapevine will completely cover the intended area along the trellis or arbor. Once the lateral shoots have grown along the top wire to the desired location, pinch the terminal ends of the main lateral shoots (on the top wire). This will force secondary shoots to develop along the two main laterals laid down to established the cordon. The cordon is a permanent structure that exists on the top wire, from which hardwood canes (hardened-off shoots) are pruned (Figure 2). Figure 2. Further training and pruning are conducted to develop the grapevine structure. Lateral shoots that emerge from the cordon should be allowed to grow uninterrupted. Only necessary shoot positioning should be done to direct growth in an orderly manner. During late February or March, each one-year-old cane (dormant cane) that grew along the cordon should be pruned back to either a three-, four-, or five-node spur (fruiting spur) or a one-node renewal spur (vegetative spur). The remaining fruiting wood should be approximately pencil size in diameter. Renewal spurs produce vegetative shoots that are used for the following year’s fruiting wood. How do I prune my grapevines after the third year of growth? Year three is the first fruiting year. Dormant pruning should be done some time in late February through March (Figure 3a and 3b). One-year-old wood (dormant canes) should be pruned back to three-, four-, or five-node spurs (Figure 4). The spurs should be evenly spaced along the cordon and pointing downward. To determine how many buds to retain for fruiting, weigh all pruned one-year-old wood. Use the pruning weight to count the number of fruiting buds to leave. You may choose to use different approaches for determining the number of fruiting buds to leave. One system is the 30-10-10, which requires the person pruning to keep track of the weighed prunings and the number of buds remaining on the intact vine. For the first pound of pruned-off wood, leave 30 buds; second pound of wood, leave 10 buds; and continue adding 10 buds for each pound of wood thereafter. For example: Three pounds of one-year-old wood have been pruned off; a total of 50 fruiting buds should be retained on the vine. Figure 3a. Non-pruned grapevine. Figure 3b. Pruned grapevine. Figure 4. Bud counts for different length of spurs. How do I prevent my grapevines from becoming a tangled mess? Many times grape gardeners find that the one-year-old canes have become intertwined along the trellis and are extremely hard to unwind for pruning. This can be controlled somewhat by shoot positioning. It is very similar to combing hair. Once green shoots are developed enough (approximately mid-July), each shoot can be placed in an orderly position along the entire cordon of the vine and parallel to the vertical trunk. Combing or shoot positioning can help to reduce the overall number of tangled shoots and can increase light penetration into the vine canopy. Increased sunlight exposure will promote good quality fruit, better winter hardiness of canes and more productive canes for next year’s crop. As Figure 5a shows, an uncombed vine will have several one-year canes trailing in different directions. A combed vine appears much neater, has better order and canes can be pruned quicker than uncombed vines (Figure 5b). Grapevine combing should be done each year so that all shoots are properly positioned along the trellis. Figure 5a. Non-shoot positioned grapevine. Figure 5b. Shoot positioned grapevine. Grapevines need proper training and pruning during the first three years. Once they start producing fruit, annual pruning is needed to maintain the balance between vegetative growth and fruit production. If grapevines produce too much fruit in one year, they will not produce a good crop next year and could suffer winter damage. If grapevines produce too little fruit one year, they will produce too many shoots and leaves that year. Cane: A green summer shoot matures (hardens off) into a woody, brown one-year-old cane after leaf fall. 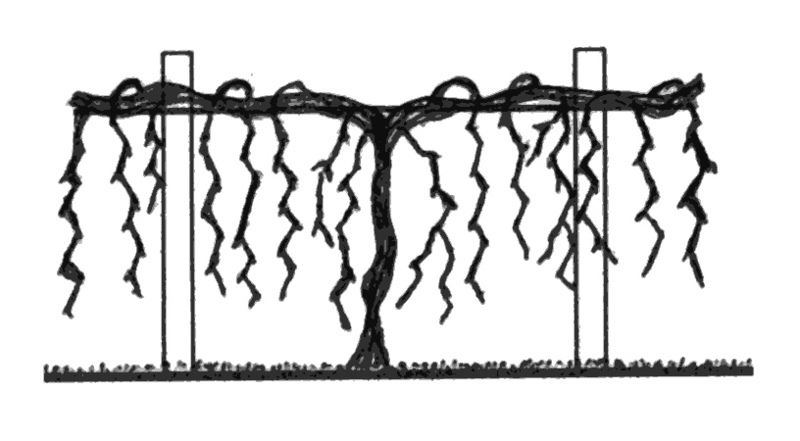 Cordon: A permanent extension of the grapevine’s trunk that is horizontally positioned along the trellis (arbor) wire. Fruiting Wood: One-year-old wood that produces the current season’s shoots and fruit. Node: The thickened portion of a shoot or cane where the leaf petiole is attached and a compound bud is located. Pruning: Removal of portions of a grapevine for the purpose of maintaining size, shape and productivity. Renewal Spur: A cane pruned to one node with the primary purpose of producing a vegetative shoot (cane) for next year's fruiting wood. Shoot: The green, leafy growth that develops from the compound bud that normally produces fruit clusters. Shoot Positioning (Combing): New shoots are positioned in an orderly manner along the trellis to allow for more even sunlight exposure on the canopy of leaves and reduce the number of canes that are tangled. Spur: A cane pruned to three to five fruiting nodes to produce shoots bearing fruit clusters. Trunk: The main, upright structure(s) of the grapevine from which cordons, shoots and canes arise. Ohio State University Extension Bulletin 919: Midwest Grape Production Guide. Ohio State University Extension Bulletin 940: Midwest Home Fruit Production Guide.